Dear Readers, sometimes when I stomp around the cemetery or the streets of East Finchley looking for a Wednesday Weed, I become a little downhearted, especially in late October when most of the plants are going to bed for the winter. I was briefly excited by a yellow brassica (and that’s not a sentence that you read every day), but then realised that it was Hoary Mustard and had already featured on the blog. Such are the perils when you’ve already written about 150 weeds in a half-mile radius of your house. 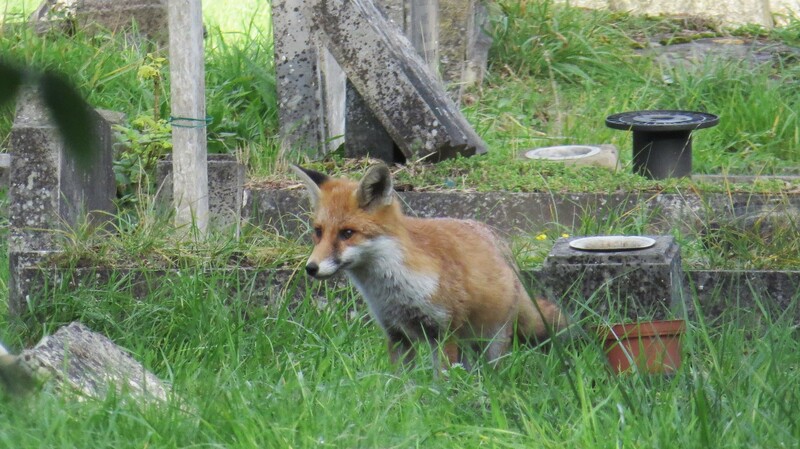 I was briefly distracted by this little chap/chappess, who was intently looking into the grass, probably at some poor rodent. However, s/he loped off without eating anything, so I suspect the mouse made a judicious escape. And then, after finding one solitary buttercup and a cinquefoil, I was heading home when I realised that although I have written about ribwort plantain, I have never featured its sibling, greater plantain. And what an interesting plant it is! This is one of those little crushed-looking plants that is always slightly damaged, and yet is very tolerant of being trodden on. 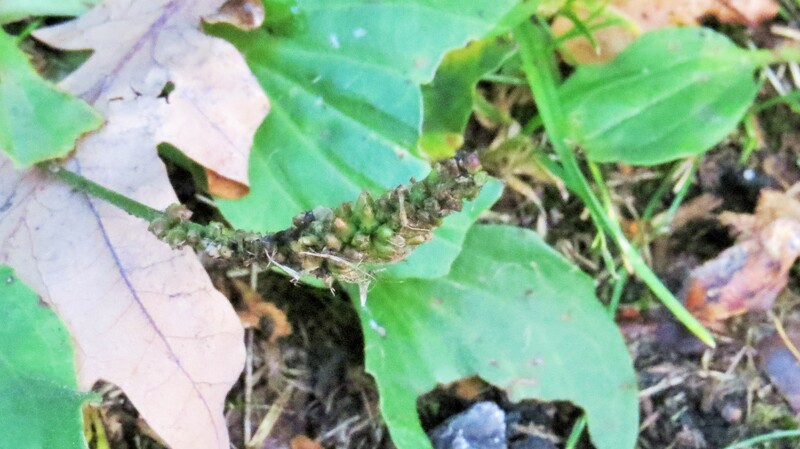 Unlike ribwort plantain, its leaves are oval shaped. The flowerspike is described in my Harraps guide as being a ‘rat’s tail’ with short stamens and small, dull, purple anthers. 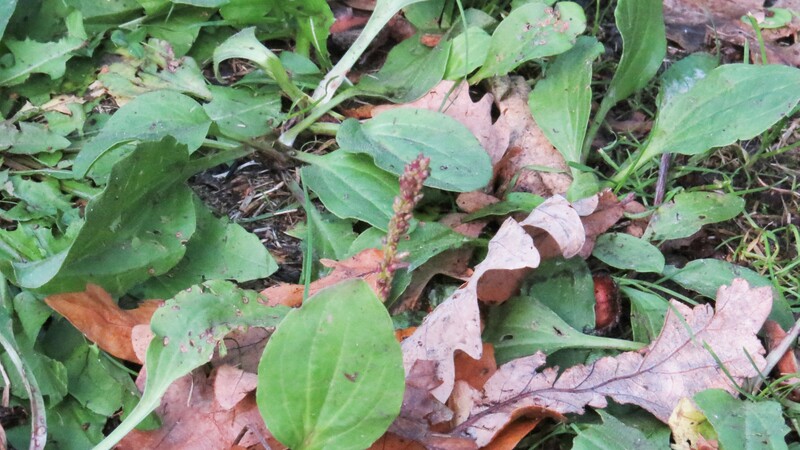 As you can see from the photos above, although greater plantain is a modest ‘weed’, it is much liked by many insects, who gnaw enormous holes in those ribbed leaves. 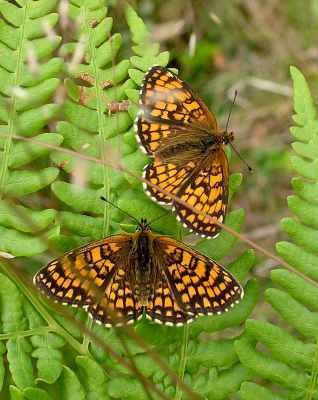 Amongst the creatures who feed upon it are the caterpillars of the heath fritillary, the wonderfully-named moth called the setaceous hebrew character, and the gorgeous buff ermine, to name but a few. 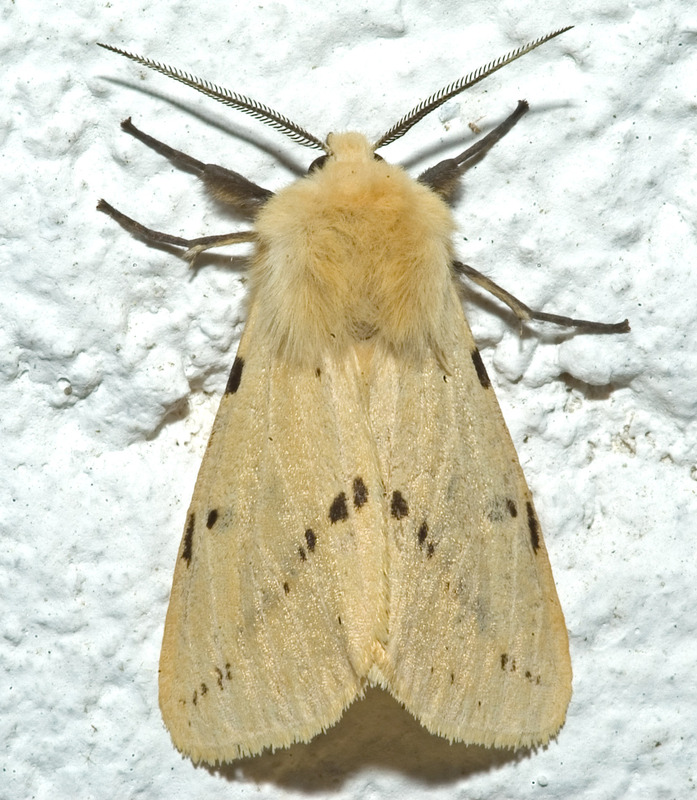 It isn’t only caterpillars who eat greater plantain, however. The young leaves can be eaten in salad, and 100 grams contains as much vitamin C as a large carrot. However, because this is a plant which can often be found on footpaths and places where dogs ‘hang out’, I would want to be extremely careful when gathering the leaves. Having said which, if you can find a clean supply of the leaves, you might want to try the technique here, from the rather beautiful Transitional Gastronomy website. 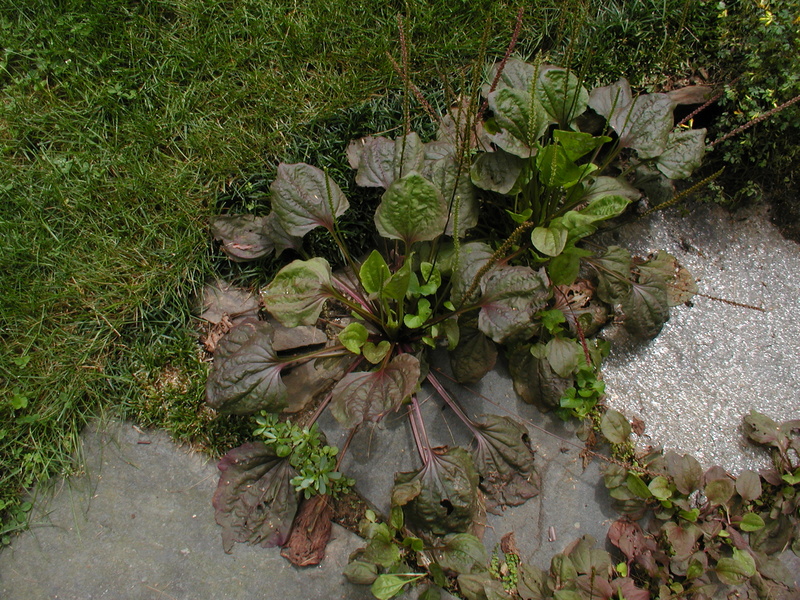 It is, however, as a medicinal plant that greater plantain has most often been used. It is often used as a poultice for stings, wounds, bruises and sores, and I’ve often used it to sooth the hives from nettle stings, something that I learned many years ago from my father. He told me that wherever nettles grew, there would always be a plant to soothe their sting, and indeed there usually is. The leaves contain cooling mucilage, an anti-microbial compound called aucubin and allantoin to promote cell-growth, plus a whole host of other useful chemical compounds. The leaves also contain tannin, which may explain why they are said to be useful in arresting external bleeding. The healing powers of greater plantain are mentioned by Chaucer and by Shakespeare, in Love’s Labours Lost and in Romeo and Juliet. Incidentally, it is also said to cure ‘the madness of dogs’, should you have any canines that are inclined to lunacy. ‘I remember we used to pull off the leaves of the ratstail plantain, and from the number of ribs and threads which pulled out and hung down, and by the length of them, that was an indication of how many, and how lengthy, had been the lies that we had told that day’. (Elizabeth Telper, Selkirk, Borders). 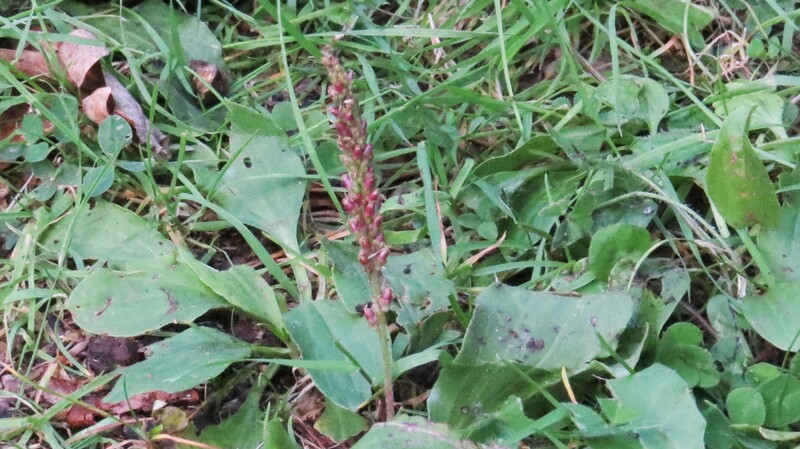 In the UK, where it is a native plant, greater plantain was known as ‘Waybread’, and was one of the Nine Sacred Herbs of the Anglo-Saxons (I have written more about this in my piece on ribwort plantain, see link above). Many legends have sprung up about the plant: a young girl was said to have waited for her lover for so long beside a path that she was transformed into a greater plantain. From that time, it was said that the plant turned into a cuckoo every seventh year, for reasons that seem far from obvious nearly a millenium later. More easily understood is the medieval tendency to include the plant in their art as a symbol of the ‘well-trodden path’ to Christ. Springs the ‘White Man’s Foot’ in blossom’. Much to my surprise, I have discovered that there is also a cultivated variety of greater plantain with shiny chocolate-coloured leaves, called ‘Rubrifolia’. I imagine that it would be perfect for growing in the gaps between paving stones, though I wonder how long it would be before its wild cousin took over. 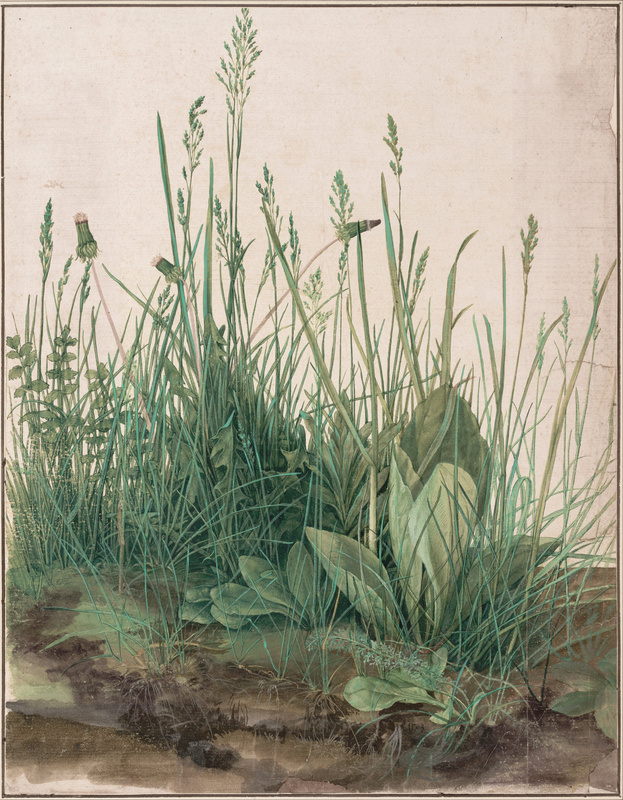 Such a humble plant as greater plantain does not seem an obvious choice for a painting, so it was with delight that I found it playing a starring role in a watercolour picture called ‘The Great Piece of Turf’ by Albrecht Durer, created in 1503. 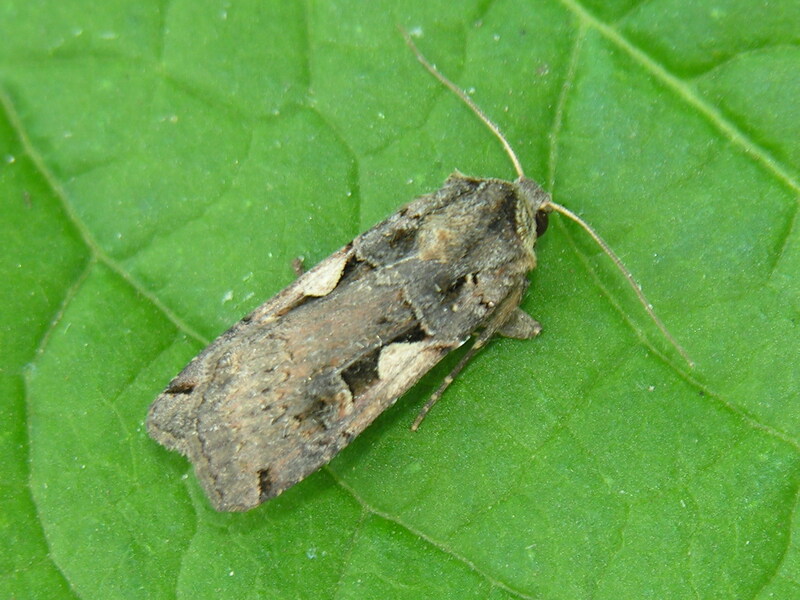 It features many other ‘weeds’ and grasses, such as dandelions and yarrow. I love the way that artists through the ages have been inspired not only by the flamboyant and the unusual, but by the things that are very close to hand. It proves to me that you don’t have to live a life filled with novelty and unusual experiences to find beauty. It’s there already, in our own streets and gardens. This entry was posted in London Plants on October 19, 2016 by Bug Woman. Oh, that Durer! wasn’t he amazing? I was interested to read about the Plantain, something that I had probably overlooked all my life. Thank you for bringing it to my attention. The cultivated version looks rather swish. 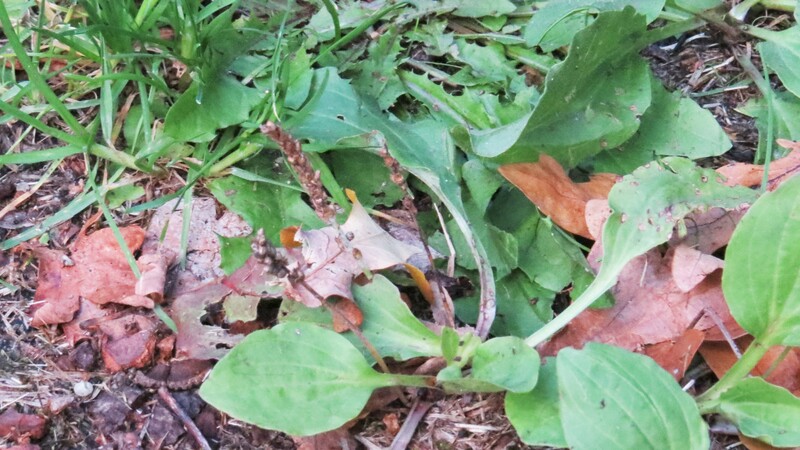 Thank you, Rosni3 – I love learning about the ‘Wednesday Weeds’ too, they have been a revelation!